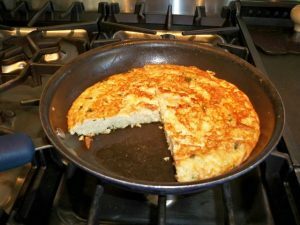 This frittata is made with leftover pasta and is just fabulous! It is also waistline and heart friendly. See the nutrition information at the bottom of the page. NOTE: I prefer 100% durum wheat semolina capellini for this recipe, but you can use whatever you have! Begin by measuring out 2 cups of refrigerated leftover pasta and put it into a bowl. Run an olive oiled knife through the pasta to cut it up a little. Make sure there are no lumps. If you need to, add a little olive oil to your hands and run them through the pasta to be sure. Set aside. 2. In a separate bowl, beat together the egg, egg whites, Parmesan cheese, crushed garlic, 2 to 3 Tablespoons of the chopped parsley, milk and a dash of nutmeg. Add a pinch of salt (not too much because the Parmesan is salty) and a healthy grind of fresh pepper. 3. Add the egg mixture to the pasta and stir together until thoroughly blended. 4. Heat an 8 inch (non-stick, if you have one) skillet over medium heat. Drizzle enough olive oil into the warm pan to coat the bottom when the pan is tilted. You won’t use as much olive oil if you add it to the pan when it is warm. 5. Once the pan is hot (not smoking, just hot), pour in the pasta mixture. 6. Cook over medium heat, lifting the sides of the frittata and tilting the pan, allowing the uncooked juices to run past your spatula into the pan below. Continue this procedure until most of the liquid has been moved to the bottom of the pan. 7. Continue cooking and occasionally shake the pan to loosen it from the bottom and at the same time, check for jiggles. The frittata will firm up as it gently cooks. 8. Lift the edges to check the color of the underside of the frittata. If it is browning too quickly and the top is still quite jiggly, turn down your heat. Once it is golden and the frittata is almost firm, you are ready to turn it over. 9. Remove the frittata from the heat. 10. 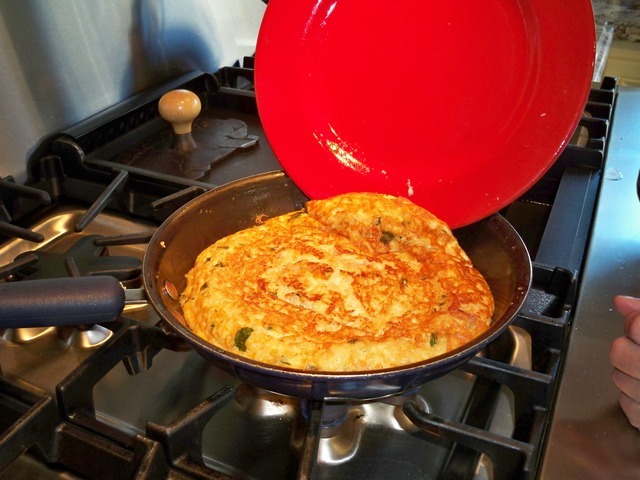 Place a plate that is a little bigger than your pan over the top of the frittata. 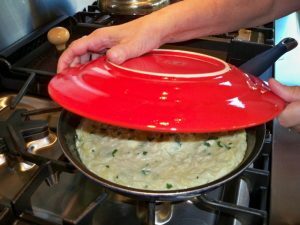 Gently turn the pan over so that the plate is now on the bottom and the pan bottom is facing you. You may need potholders. 11. Give the pan a gentle shake and the frittata should fall onto the plate, if it hasn’t already done so. 12. Replace the pan to the heat and add a little more olive oil. 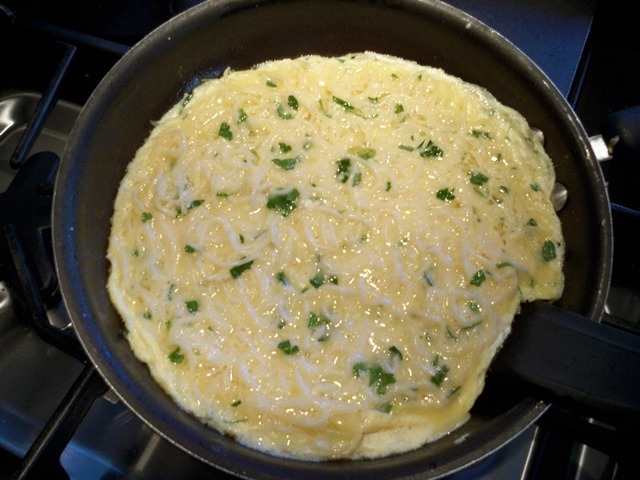 Now gently slide the frittata into the hot pan and continue to cook for 5 minutes or so, until firmly set. 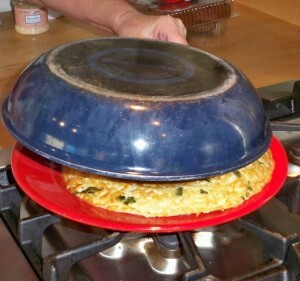 The middle of the frittata will begin to “puff up” as it cooks. 13. Cut into slices, sprinkle with a little more Parmesan and serve with fresh fruit or steamed broccolini, tomatoes with herbs (pictured above recipe) or a crisp salad. You won’t need any sauce with this frittata. It is very creamy and satisfying! 2 teaspoons of extra virgin olive oil has 10.5 Grams of fat and 90 calories.